To see a selection of work included in +1+1, click here. 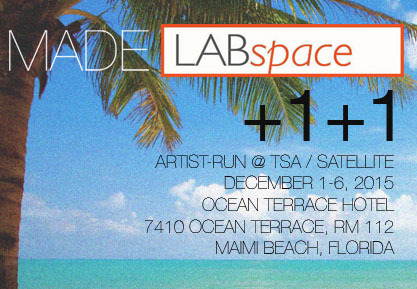 MADE and LABspace join forces to present “+1+1” - Room 112 at the former Ocean Terrace Hotel in Miami Beach - as part of the Tiger Strikes Asteroid (TSA) “Artist-Run” project for SATELLITE during Miami Art Week December 1-6. Press preview and vernissage is 6-10pm on Tuesday, December 1. “+1+1” is a curatorial experiment in which 6 artists affiliated with MADE and LABspace each invites another artist and those invite one more artist each to participate. The installation includes a total of 18 artists from NYC, Miami, and abroad exhibiting sculpture, painting, works on paper, performances, projected video, all of which together creates a layered and wholly unexpected, exciting, and dynamic installation. The curatorial process is experimental, collaborative, and ultimately founded in artistic trust and openness. Black Lake Sky performances: Thursday, 12/3 at 2pm and Friday, 12/4 at 7pm. Join us at 6pm Friday for a special pre-performance prosecco happy hour. The “+1+1” installation is located in Room 112 of the former Ocean Terrace Hotel at 7410 Ocean Terrace in Miami Beach. Organized by Tiger Strikes Asteroid, the “Artist-Run” project takes over the former Ocean Terrace Hotel with an international collection of nearly 40 artist-run spaces creating installation/environments in the rooms of the hotel (see list of participating organizations below). "Artist-Run" is part of the SATELLITE project to transform an entire neighborhood into an arts destination during Miami Art Week.